A global insurance cooperation maintains its master data centrally within CSV files. To consolidate the financial statements, these files are uploaded quarterly into the business warehouse and other SAP supply systems. The systems are updated through a synchronisation process that sometimes causes minor differences in the master data. These differences regularly lead to incorrect and incomplete calculations each time the financial statements are prepared, resulting in very expensive and time-consuming error analysis and corrections. Business users urge for a tool to monitor the flow of the distributed data across several SAP systems and different system environments. For this quality check, OMrun compares the master data that was collected with MDX queries from all relevant SAP systems. This process has been realized for all existing system environments of this cooperation. Quality checks can therefore be executed in any of the system environments at the push of a button. It was made possible to process two data based system requests at the same time automated and rule based. This process is executed every quarter and ensures the data quality of master data prior to the creation of the consolidated financial statement. The result of this quality check is a detailed report whereas mainly the differences - we call them "rule violations" - are of interest. 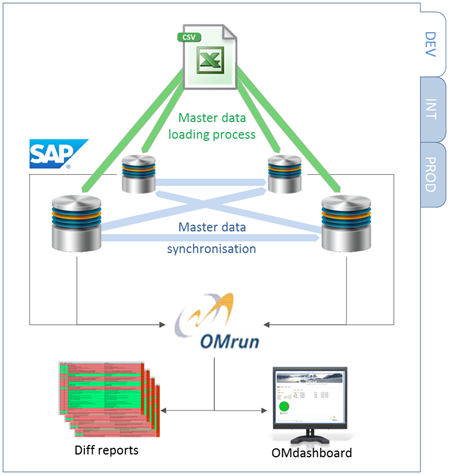 This report of the rule violations is the baseline to correct the SAP systems with inconsistent master data after what the retests of the adjustments will be executed with OMrun again.